Now imagine eliminating that pollution at the source. We're not talking about spraying a cloud of flower-fragranced chemicals. Our solution is as easy as pushing a button to keep things cleaner and safer to touch, not to mention smelling fresher. The FreshAir Everest by Vollara is a revolutionary air purifier that does so much more than clean the air. Using the same science as nature, FreshAir Everest destroys odors, eliminates smoke and reduces harmful contaminants or pollutants ordinary cleaning can leave behind. So how does the FreshAir Everest clean and freshen the air? In short, it is technology based on how nature keeps things safe and clean outdoors. The natural processes found in thunderstorms, sunlight, and lightening are re-created indoors. ActivePure Technology duplicates nature to safely reduce contaminants and on surfaces. FreshAir Everest by Vollara is like 24/7 healthy home insurance. It is the core of Vollara's total protection package for whole-home environmental conditioning. FreshAir Everest is always working - sending out an active army of safe and natural ions as well as pollutant-controlling, odor reducing and oxygen-rich 'scrubbers' to make your home safer and healthier. 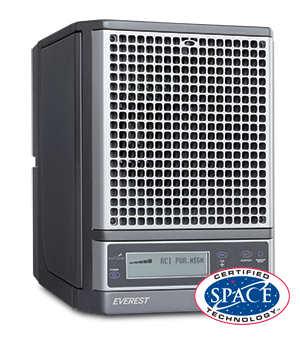 The advanced technology contained within the FreshAir Everest serves to make breathing easier, cleaner and healthier. This convenient, in-home unit provides the cleanest, freshest air possible throughout the entire home. IntelliAir Technology alerts you when normal maintenance is needed or service is required. Drinking enough water isn’t really enough. You have to drink the right kind of water - water that will help buffer acid, help remove toxins, and is easily absorbed by your body. You need great tasting water with antioxidant properties and proper pH levels. 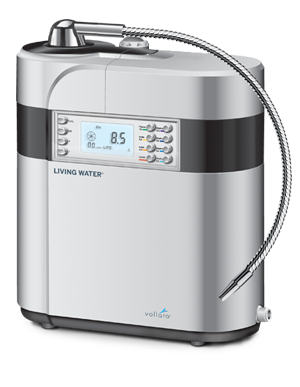 Having a LivingWater is like owning a limitless supply of alkaline, ionized, healthy water. You get pH-balancing, healthy alkaline water for drinking and cooking, strong alkaline water for washing vegetables, and acidic water for cleaning. Plus, when you drink alkaline water regularly, you’re helping your body to hydrate itself as well as flush out toxins and waste products. If you’re trying to lose weight, you may get a boost there as well. Overall, there’s no better way to help stay healthy. Utilizing Direct Disk Ionization (DDI) Technology™, LivingWater is a revolutionary approach to water ionization. Designed by the inventor who holds the first water ionization engine patent, it does not require numerous plates or membranes. While conventional units require a low flow rate to maximize ORP (Oxidation Reduction Potential), LivingWater with Direct Disk Ionization (DDI) Technology™ can achieve the same ORP levels at a higher flow rate. The Direct Disk Ionization Technology and constant power output design produce ionized water with the least amount of electrical energy needed. Similar to a compact fluorescent lightbulb which uses less energy for the same amount of light output as an incandescent bulb, LivingWater is a more efficient use of energy than conventional plate units. 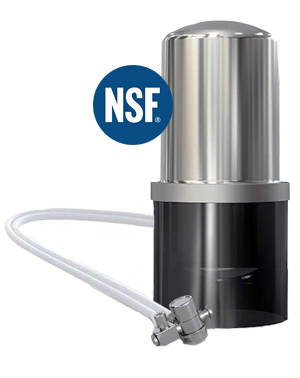 The Aquaperform features a stainless steel housing and is designed for additional contaminant reduction performance, adding Arsenic V to its list of filtered contaminants. This unit sits on your counter next to the sink with an included acrylic base. It connects to your existing faucet using a dual-hose diverter valve that allows you to easily switch from filtered to unfiltered water. The countertop Aquaversa is generally intended for use where below-sink installation restrictions are present (e.g., apartment use or lack of below-sink space), although it can be converted for below sink use with additional parts. Drinking water pollution comes from many sources. Surface water can become contaminated with agricultural runoff, community landfills, and hazardous waste from manufacturing byproducts. Groundwater can become contaminated from gasoline and MTBE leaks from underground storage tanks, or from the injection of hazardous waste into deep wells. Significant growth of the drinking water treatment industry can be attributed to the consumer demand for products that can 1) protect them from potentially harmful contaminants in their drinking water, and 2) improve the aesthetics of their drinking water. The effectiveness of any drinking water treatment device is measured by the performance of its filter. A close review of drinking water treatment unit certifications shows that Solid Carbon Block filters are the most effective for reducing a wide range of contaminants, including those that may be found in groundwater. Certain drinking water treatment units utilizing Solid Carbon Block filters have been tested and certified to reduce upwards of 65 contaminants. Solid carbon block filter technology was developed by Multipure in the early 1970s for the purpose of treating water contaminants for health and aesthetic reasons. This technology combines mechanical filtration, chemical reaction, and physical adsorption into a single device to reduce a broad spectrum of harmful contaminants. Activated carbon is the primary raw material used in Solid Carbon Block filters. These activated carbons are effective in reducing disinfection by-products (DBPs), volatile organic compounds (VOCs), PCBs, MTBE, and other contaminants. Solid carbon block filters effectively treat contaminants such as lead, chlorine, benzene, MTBE, chloramines, and PCBs. Solid carbon block filters will likely prove capable of significantly reducing contaminants that may be found in drinking water supplies in the future, such as antibiotics, drugs, and other personal care products. The effectiveness of Solid Carbon Block filters in treating a broad spectrum of contaminants of aesthetic as well as health concern makes it the bona fide technology of choice consumers throughout the country. For a detailed list of contaminants click here.